Monday – Sunday including public holidays. SAVOUR a lobster feast at Sri Ayutthaya in conjunction with the Songkran festival this month. The restaurant chain will be serving up a Songkran Special Menu from April 13 – 30 in all three of its outlets. The Songkran festival is celebrated from April 13 – 15 in Thailand as New Year’s Day. The throwing of water is the most evident celebration of Songkran. “Don’t worry, you will not be drenched with a bucket of water but rather a light sprinkle of water to mark the festival as you step into the restaurant,” says media manager Vivien Low. 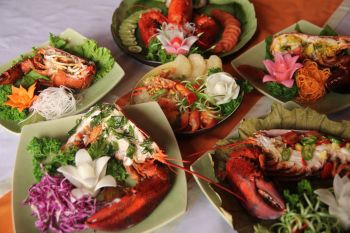 PROMOTION: The Songkran Special Menu consists of five lobster dishes. “In conjunction with Songkran, we decided to come up with a live lobster promotion since lobsters live in the water,” she adds. 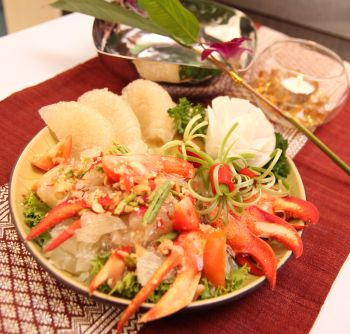 The menu includes five different whole lobster dishes and a very exclusive lobster claw Somtam which is the first of its kind for Sri Ayutthaya. The Thai Somtam Pamelo with Lobster Claw or Somtam Som O Ruam Gam Lobster comes in three different serving sizes and priced accordingly; RM29.90++(S), RM39.90++(M) and RM59.90++(L). The spicy salad with lime and chilli melds together the flavour of the slightly sweet pomelo and whole lobster claw to perfection. The other lobster dishes on the menu are priced at RM19.90++ per 100g of which the normal price is RM21.90++ per 100g. You will be able to see your lobster before it goes into the wok. The promotion includes whole lobster dishes for which one cooking style is meant for the entire lobster. Steamed Live Atlantic Lobster with Thai Garlic And Lime, Live Atlantic Lobster with Thai Basil Leaves, Live Atlantic Lobster with Young Coconut Flesh, Live Atlantic Lobster Wokked with Homemade Paste and Live Atlantic Lobster Wokked with Turmeric Sauce are the dishes included in this promotion. The Live Atlantic Lobster Wokked with Homemade Paste and Live Atlantic Lobster Wokked with Turmeric Sauce were some of my personal favourites. The homemade paste is a sweet-sour tasting sauce with pineapple and my all-time favourite, cashew nuts. The crunchy nuts with the combination of the sweet flesh of the lobster is indeed an interesting combination. The Live Atlantic Lobster Wokked With Turmeric Sauce on the other hand, is another dish with a distinct taste. The yellow, turmeric infused lobster flesh tastes absolutely delicious and is bound to make you ask for a second helping. Other dishes from their menu worth trying include Tom Yam, Green Curry Chicken and Kerabu Rambutan. The Green Curry Chicken comes in three different sizes (RM18.90++(S), RM24.90++(M), RM33.90++(L)) and is sinfully rich. The dish prepared with green chillies, long beans, chicken, eggplants and thick coconut milk is one of the best I’ve tasted so far. Green Curry Beef is also something they are well-known for. Exclusive: The Thai Somtam Pamelo with Lobster Claw comes in three different serving sizes. The Kerabu Rambutan (RM25.90++) was another strongly recommended dish by Low. This dish incorporates the unlikely combination of rambutans with fried squid, onions, chillies and lime and tastes good too. The Lychee Coconut drink (RM12.90++) is also a must try. The concoction of lychee syrup blended with coconut and ice appealed to me. Other combinations like dragon fruit and kiwi are also available. Desserts come out in a tray with small portions displayed for you to choose from. Beware lest the portion size fools you. The actual dish may turn out to be double the display size. I enjoyed the Durian Chendol (RM9.90++), a dessert with a strong durian taste, chendol and rich coconut milk. The Pumpkin Custard (RM9.90++) is bound to catch your eye. A slice of the thick yellow flesh of pumpkin is found encasing the milky white custard and is topped with orange shavings which are egg. Needless to say, it was a wholesome meal topped with dessert to seal the deal.